Maria De Los Angeles Ybarra was born on August 1, 1958 in Laredo, Texas. She moved to California as a young woman. She met and married the love of her life, Servando Ybarra in 1994. Together they raised three sons. Maria was a joyful person who loved life. She enjoyed dancing, singing, and tending to her roses the outlined her front yard. Maria entered eternal life in Bakersfield surrounded by her husband and family. Maria was 60 years old. Maria is survived by her beloved husband, Servando Ybarra; sons, Jorge Contreras, Jaime Contreras, Pedro Contreras; sister, Estella Garcia; 11 grandchildren; many nieces and nephews. Maria De Los Angeles Ybarra nació el 01 de agosto de 1958 en Laredo, Texas. Ella se mudó a California como una mujer joven. Conoció y se casó con el amor de su vida, Servando Ybarra en 1994. Juntos criaron a tres hijos. Maria era una persona alegre que amaba la vida. Disfrutó bailando, cantando, y tendiendo a sus rosas el contorno de la yarda. María entró en la vida eterna en Bakersfield rodeada por su esposo y su familia. Maria tenía 60 años. Maria es sobrevivida por su esposo amado, Servando Ybarra; hijos, Jorge Contreras, Jaime Contreras, Pedro Contreras; hermana, Estella García; 11 nietos; muchas sobrinas y sobrinos. To send flowers or a remembrance gift to the family of Maria De Los Angeles Ybarra, please visit our Tribute Store. 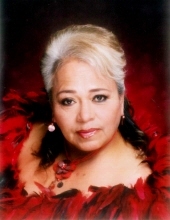 "Email Address" would like to share the life celebration of Maria De Los Angeles Ybarra. Click on the "link" to go to share a favorite memory or leave a condolence message for the family.